Folan puts it best when he says, “Let’s saying, “The little guy can make it.” simple compliance isn’t enough. In the pliance, without ‘buy-in’ from the per- not ? nd out.” I think that’s good advice. 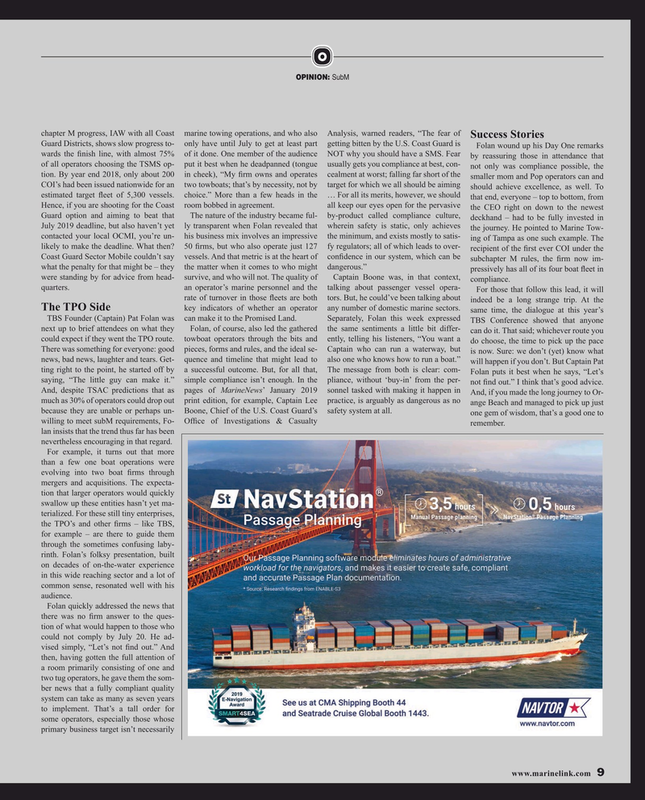 And, despite TSAC predictions that as pages of MarineNews’ January 2019 sonnel tasked with making it happen in And, if you made the long journey to Or- much as 30% of operators could drop out print edition, for example, Captain Lee practice, is arguably as dangerous as no ange Beach and managed to pick up just because they are unable or perhaps un- Boone, Chief of the U.S. Coast Guard’s safety system at all. one gem of wisdom, that’s a good one to willing to meet subM requirements, Fo- Of? ce of Investigations & Casualty remember. lan insists that the trend thus far has been nevertheless encouraging in that regard. For example, it turns out that more than a few one boat operations were evolving into two boat ? rms through mergers and acquisitions. The expecta- tion that larger operators would quickly swallow up these entities hasn’t yet ma- terialized. For these still tiny enterprises, the TPO’s and other ? rms – like TBS, for example – are there to guide them through the sometimes confusing laby- rinth. Folan’s folksy presentation, built on decades of on-the-water experience in this wide reaching sector and a lot of common sense, resonated well with his audience.